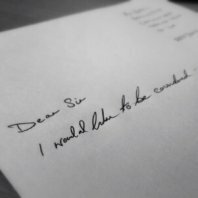 Cover letters, love them or hate them the questions we are constantly asked are, “should I send a covering letter?” and “what should I should write in my covering letter?“. For this post I’m going to quickly focus on the first question. It struck me this week that a CV without a covering letter could be construed as lacking effort on the part of the applicant. The rational behind this lies in a technical glitch that we encountered last week. We are currently recruiting, via Grieves Pryce, a Chief Executive for a company that has a major consumer influence in the retail sector. Part of all recruitment process these days is parsing or ATS and system decided not to copy some of the covering letters into the candidate file. When we were performing the daily review of applicants it quickly became apparent that something had gone awry. We quickly rectified the situation and carried on as normal – with no further issues. Except one. Whilst I was going through the applications I found that I was becoming increasingly annoyed at the lack of cover letters. The more applications I saw without letters, the more my annoyance became entrenched in my mind. I was prejudging these CVs because I could not see a supporting cover letter. I thought that they were being lazy with the application, showing an ignorance and arrogance for the process that was bordering on utter contempt. I might also have had a little too much caffeine. When we rectified the error the lingering sensation was the feeling that failure to use a cover letter needed to be considered in a different way; if I my emotions were impacted in such a negative manner would it not have the same effect if an applicant sent a letter when not required? Would it be seen as an irritant in the eyes of the person overseeing the process? After a little introspection I concluded that a cover letter shows (providing it’s targeted at the job) the human side of a person. If well written, it should be a quantifying statement of intent and the difference that separates you from your peers by giving an opportunity to communicate why you have the required proficiency for the role. Regarding my initial observation, If you are a Senior Executive, sending a cover letter is, in my opinion, a must.